If you would like to receive a proposal for search engine optimization, search engine marketing, or web design services please call us at 801.512.2006 or contact us using the form below. Website Design SEO Marketing Portfolio Get a Quote! 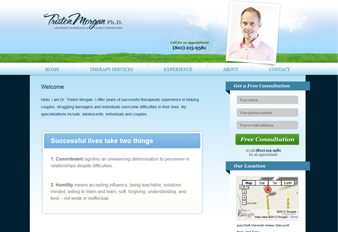 Triston Morgan is a licensed therapist in Utah. He specializes in marriage and family therapies, albeit it individuals, couples or adolescents. Dr. Morgan has extensive experience working with rehabilitation services, community therapy centers, residential adolescent programs and wilderness therapy. He strives to help patients overcome emotional issues and difficulties, while building self-esteem and learning to create lasting relationships. While Adaptivity Pro is not a large conglomerate web design and Internet marketing firm, it is a company that is thoroughly committed to the success of their clients, completing all sizes of projects with the exceptional quality. Adaptivity Pro works with small and large businesses, whether they are located within the U.S. or internationally. Clients agree that Adaptivity Pro's reasonable fees are well worth the finely tuned product they receive.